Spur is a popular chain restaurant in South Africa. They often have really cheap specials, and right now their breakfast special is two eggs, chips, bacon, fried tomato, toast and jam for only R25 ($2.65). Of course they then charge you R15 ($1.59) for coffee or juice, and then a tip. So you're pretty much into R50 ($5.30) by the time you're done, but it's still a good deal. And in a nice setting! Ruth and Didi at our breakfast spot. Holy Trinity Church in Belvidere, South Africa. Known simply as Belvidere Church, this tiny church only seats about thirty people. It was completed in 1855. The back of the church is round! From there, we continued uphill towards the community of Brenton-on-Sea. Mostly expensive homes with ocean views and a beautiful beach. On the way to Brenton-on-Sea, you get a nice view of Knysna on the other side of the lagoon. Enjoying the view at Brenton-on-Sea. From there, we went all the way back around the lagoon, through Knysna itself and to Leisure Island. We only drove around the island, but stopped to have a picnic lunch. From there, we drove up to a viewpoint on "the heads" which are the two sides of the ocean opening from the lagoon. Looking back to the Knysna lagoon. Looking towards the ocean, you can also see some very expensive homes who have their own private ocean view! Ruth, enjoying the view. On the other side of the railing, it is straight down! Back at Didi's for dinner, where we enjoyed a beautiful sunset, a shrimp dinner, and great conversation that lasted until past our bedtime! Beautiful. Some of those expensive homes are very close to the edge! Tony not really. You looking from in the R1 million up. I have a few that is over R2 million with lovely views. Just sold one to people in the UK at Brenton on Lake for just over R1 million. But more important is that Knysna and the whole of the Garden Route is truly beautiful and the place where you would love to stay!! Knysna is a lifestyle choice destination and we have a lot of retired people form all over the world that stay here. Yep, some of them were really close to the edge. I am glad that I wasn't the one having to help build them, imagine their view though! Looking at your pictures, "WOW!" just doesn't seem fitting enough. They must be really breath taking in person. So far all the way along the coast has been beautiful but Knysna is a really beautiful area. Those of us feeling the effects of the "polar vortex" would agree with Bob. We agree with him too Elaine, especially when we look at the temperatures you're having at home. Great place! all I can say is WOW. You'll just have to start saving up your money and come and see it all for yourself. It is amazing here! Kevin and Ruth.... WOW... how time flies if one spend quality time with interesting people. Thanks for the opportunity to host you at my place. Looking forward to stay connected and to follow your adventures. You are truly an inspiration. Thank you so much for everything Didi, you were a fantastic host! We really enjoyed our time with you and all the tips you gave us with where to hike and where to get some of the best views. Looking forward to staying in touch as well and remember if you have any questions on where to stay in Mexico if you do end up going, let us know, and even when you do decide on where to go hopefully we can help you out with some things to see and do in the area. Enjoy the time you have with the boys and your daughter-in-law. You're welcome Mary-Part, glad you are enjoying it! You are indeed in a beautiful part of South Africa. We were brought up in S A and lived for 30 years in George which is 56 Km's west of Knysna up the coast. We now live in Coffs Harbour, Australia, another lovely place for you to visit. Thanks from all us armchair travellers for your very interesting blogs and photos. Yes, it is indeed a beautiful part of South Africa. We skirted by George on our way to Knysna but didn't go into George. We would love to visit Coffs Harbour and just about anywhere else in Australia and perhaps one day we will make it there. 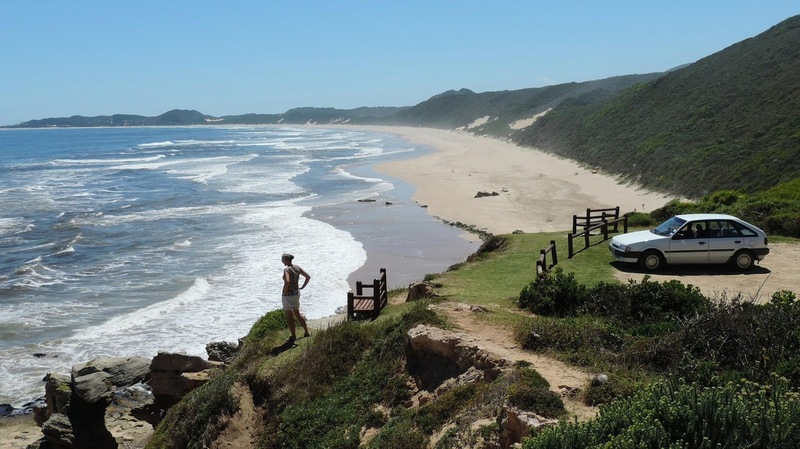 I'm booking at trip to Knysna right now and was wondering what location is best? I'm looking at the Phantom Forest Tree houses and The Lofts on Thesens Island. I guess it would depend on what you are looking for! Phantom Forest Tree houses look pretty cool and in an area that we would love to visit, where as the The Lofts would be close to town but would also be much busier and more touristy. The coast around The Heads was really nice and we could have spent much longer in that area than just the hour or two that we did. We prefer to stay away from the crowds, that is why I think we would like the Phantom Forest area.